Meade and Celestron are the two dominant players in the telescope market. In the past, the astro gear (LX200GPS, ASGT tripod, HyperStar, etc…) we looked at was more suited for advanced amateurs. Some readers have asked if we would recommend some quality telescopes for beginners and youngsters. We thought it was a reasonable suggestion and began looking around. Turns out, finding a good quality beginner telescope was more difficult than we thought it would be. If we saw large colorful close-ups of planets, galaxies, or comets on the box, we skipped it; there is zero chance one will see ANY of them with a low-power telescope. We think it is blatantly false advertising and sets a completely false expectation of what one may see with that instrument. We wanted no part in perpetuating such falsehood. One telescope company did catch our eye. 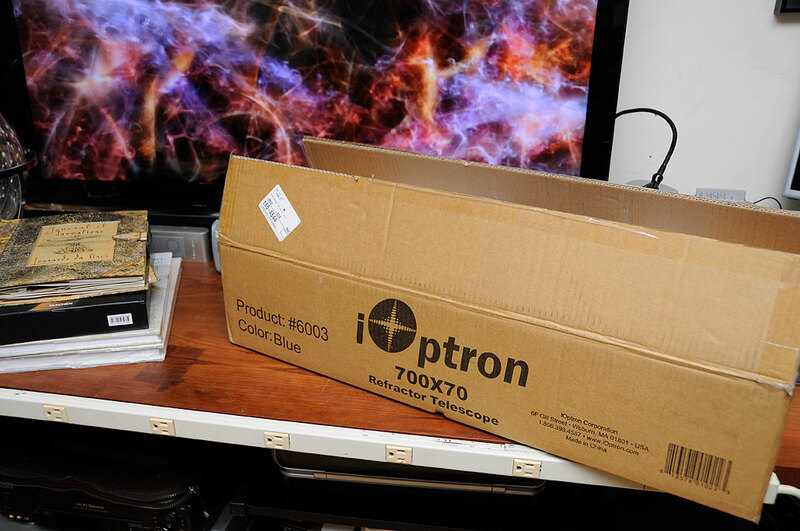 That company is iOptron. 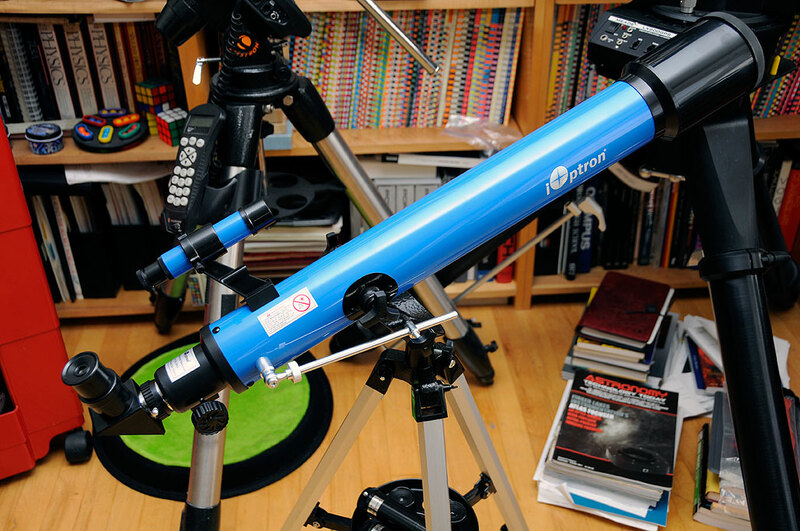 iOptron offers a range of mounts and telescopes for both beginners and serious amateurs. They are a new player who has been steadily gaining traction because their gear strikes a good balance between price and quality. One such example is iExplore 70AZ 70mm reflector telescope. 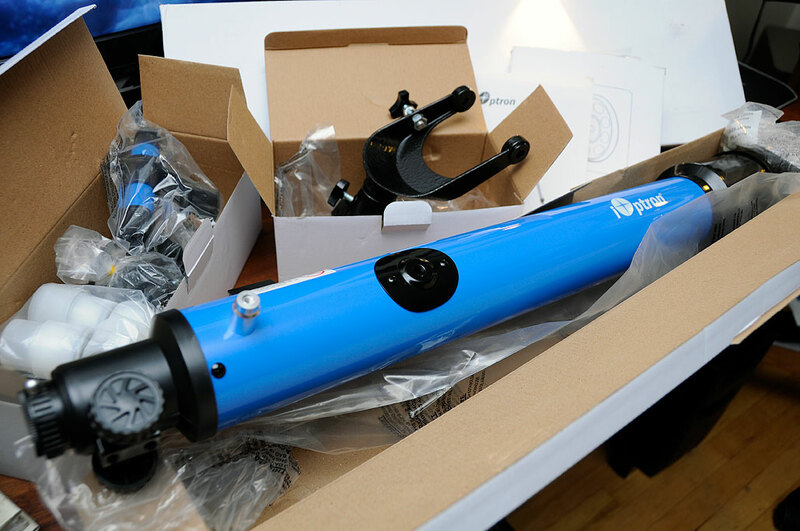 The iExplore telescope comes well-packaged, but un-assembled. It is a good way for the new owner to get a first-hand understanding of all the parts which go into making up the scope. There are about seventeen different pieces to the telescope, but putting it together is fairly self-evident. The entire process should take no more than fifteen to twenty minutes. Assembling the tripod was very straightforward. There was really no way to put it together improperly. The one snag we ran into was facing the legs the wrong way, but it was easily noticed as the three-prong brace would not attach to the legs otherwise. Once the tripod has been assembled, mounting the tube was just a simple matter of two screws. The other pieces (angle prism, eye piece, etc…) went on without any problems. In a lot of ways, simplicity of use may be the most important factor with a beginner telescope. This telescope is only six pounds fully assembled so it will be easy to transport and quick to setup. Getting the scope outside and setting up quickly when the seeing is good will probably make a beginner more enthusiastic about astronomy than having to wait an hour for the scope to “settle down” just to see a sharp point of light. We will take the scope out on the next clear night and see what we can see with it. The moon is out and Jupiter is in the sky this time of the year. This iOptron 70mm refractor telescope should be perfect for lunar observations and should give us reasonable views of nearby planets. With the proper accessories, one can even take afocal images directly through the eye-piece. Look for the FirstUse write-up before the end of the year. Converting the scope to a 1200mm telephoto lens.